Growing up, I was obsessed with Lego blocks. I’d spend hours pouring over the tiny brightly colored bricks. I also loved the original three Indiana Jones films (the fourth film I refuse to acknowledge). I saw Lego Indiana Jones: The Original Adventures as the melding of some of my favorite childhood memories into a family-friendly game that will surely disappoint my lofty expectations—after all, movie-based games often disappoint. But I was wrong; it’s a colorful and unique experience that actually is fun for all ages. 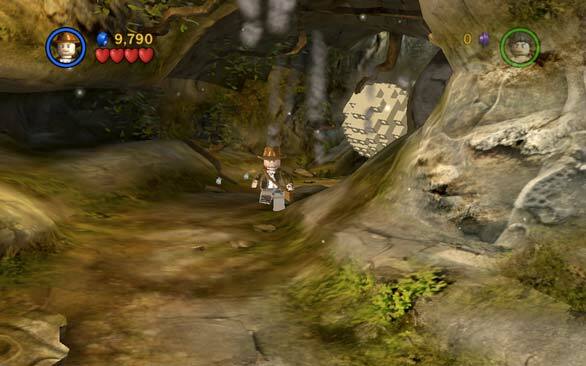 Doing justice to these two enterprises is a tough task, but Lego Indiana Jones succeeds by preserving the spirit of the movie franchise and the innocence and quirkiness of the Lego legacy. The game encapsulates the three movies into three satirical game episodes; the developers pay tribute and lovingly mock the source material at the same time, making for a humorous and enjoyable experience that new and old fans will like. Certain plot elements and adult-themes are omitted to keep the game family friendly; you won’t see any little Lego men with swastikas, nor will you see the more mature scenes of the second movie, Indiana Jones and the Temple of Doom. Instead, the game is painted in a light-hearted brush, which translates to (mostly) well-timed slapstick elements and a focus on physical comedy. The gameplay combines elements of adventuring and platforming. You guide Indiana and one of his friends around obstacles, over pits, and into various fights. Each character has a special ability that will help assist you in your quest: Willie breaks glass with her voice, Short Round can crawl into small spaces, and Henry Jones Sr. can read hieroglyphics. You’ll often be tasked with assembling little Lego contraptions to get around obstacles or you’ll have to chase down a key in order to unlock a door. Occasionally, you’ll have to drive a vehicle through a small area, and the controls are so stiff and unintuitive you’ll be thankful that these segments are brief. The combat tries to mimic the chaotic brawls of the movies, and Indiana has a full regiment of throws and punches that will take out any enemy with one move. There are melee and projectile weapons as well, but the auto-aim system is so broken you’re as likely to take out your partner as you are that enemy aiming a bazooka at you. The game becomes exponentially more difficult around boss fights that require the use of projectile weapons; for example, the end of the motorcycle chase features a boss fight requiring great aiming and maneuvering, two things the game doesn’t excel in. Feral Interactive does a solid job of once again porting a fun PC game to the Mac in short turnaround time (six months this time). The problems with the game aren’t Feral’s fault, but they are nevertheless noteworthy. The pathfinding errors and wonky respawn formula that plagued the Lego Star Wars series return here, with a vengeance. For example, you’ll hit an obstacle that will instantly kill you and you’ll respawn a short distance away; unfortunately, sometimes you’ll respawn within range of the obstacle, and you’ll be stuck in an infinite loop of death. Then you run into another frustrating aspect of the game: if you quit or restart a level you have to start at the very beginning, meaning you’ll lose all the progress in the areas you’ve successfully completed. There are also some platforming tasks, like one involving rotating pillars, that are absolutely cruelly difficult. The game will take about eight hours to play the entire way through, but to reach 100 percent completion you’ll need to go back through the levels again with different characters to get every treasure chest, unlockable character, and secret. The game has some limited multiplayer, but unfortunately its relegated to the same keyboard. The John Williams soundtrack and its iconic theme music plays throughout the game, but it’s a thin song selection and gets repetitious quickly. I ran the game on a 2.4GHz MacBook Pro and found that while the graphics weren’t particularly sharp, the cartoony feel of the game didn’t necessitate minute details. One important game requirement of note: the game will not run on a Mac mini. 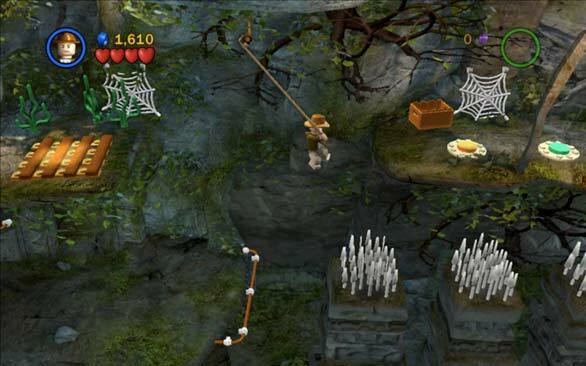 Don’t let the franchise name deter you—Lego Indiana Jones is a solid platformer, a humorous ride, and a satirical look at one of films’ great franchises at the same time. The pathfinding, respawn, and aiming issues can be irritating, but they shouldn’t deter you from a warm, colorful romp. It’s probably the most wholesome entertainment you’ll have since fingerpainting.